Today's episode of Investing in Real Estate is sponsored by FilterEasy! FilterEasy is a super convenient subscription service that makes it impossible to forget to change your filters. With FilterEasy, when it's time to change your filters, they'll be at your doorstep! FilterEasy is offering our listeners their first order for FREE! Sign up at FilterEasy.com and use code INVESTING or call 1-855-910-EASY (3279). Have you ever wondered how to find private money? Are you scared of the idea of approaching a private lender? If so, today’s guest can help you change your perspective and start accessing private capital in order to take your business to the next level! I’m thrilled to share my conversation with Susan Lassiter-Lyons with you. Susan is an investor, entrepreneur, coach, and author, who has done over $800 million in real estate deals around the world. 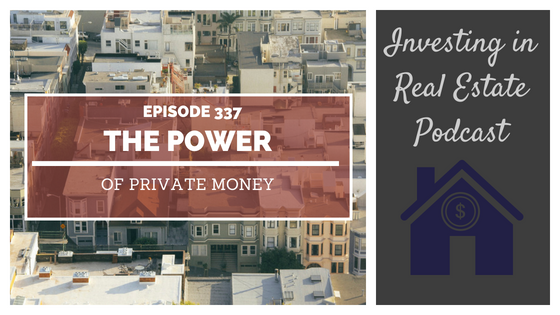 On this episode of Investing in Real Estate, Susan is sharing her tips on how to leverage private money, why private money is an appropriate means to invest, and the ins and outs of approaching a private money partner! Susan Lassiter-Lyons spent many years traveling the country, working in the rental car business. Consequently, she spent many nights alone in a hotel room watching television. One night, she happened to see a Carleton Sheets infomercial that touted the benefits of a no-money down real estate strategy. She immediately ordered the system, studied it in-depth, and began implementing the process. This was in 1994, but today Susan has become an expert in raising capital, has closed over 800 real estate transactions, authored a best selling book, and taught students all over the world how to find freedom through real estate investing. Susan believes that all roads lead to private money, and her mission in life is to teach others about the power of private money. She posits it’s not a requirement to begin real estate investing with your own funds, and in fact, it’s absolutely appropriate to use other people’s investment capital for 100% of your investment. She strives to teach others how simple private money can be, and the first step is overcoming fear. She explains that in order to achieve any caliber of success, it’s imperative to get in the right mindset. Many of us have negative feelings tied to the concept of money specifically. That’s why Susan doesn’t like to use the word “borrow;” it conjures feelings of vulnerability and neediness. She also doesn’t use the term “private lender,” but instead, “private money partner.” By changing the dialogue, it puts the two parties on an equal playing field, as partners. On this episode, we also talk about the uniformity and strictness that exists within traditional bank financing. We also talk about the significance of creativity when running a business, why rental real estate income is so reliable, and how you can structure your own private money program. Susan has so much valuable knowledge to share; you won’t want to miss this episode of Investing in Real Estate! What is a portfolio lender, and how can you utilize them in your business? Should you start out buying single-family homes? How can you structure a private deal around your business needs? What is the number one question you should ask a lending prospect? How to maintain long-term relationships with money partners. And much more about acquiring real estate through private money!